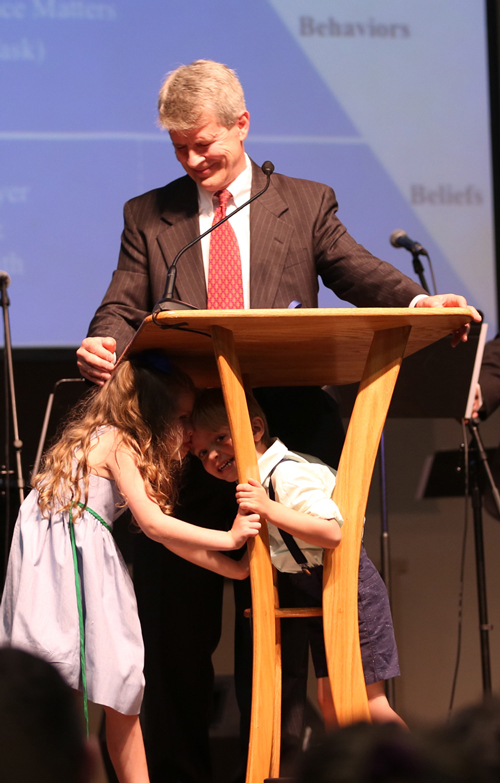 Applause thundered in Shortess Chapel on April 18, as students, faculty, friends and family gathered to honor and thank outgoing CIU President Dr. Bill Jones for his leadership, vision and service to CIU over the last 10 years. Jones is moving to the chancellor position at CIU on July 1 when Dr. Mark A. Smith becomes president. Resolutions honoring Jones were presented by representatives of South Carolina Independent Colleges and Universities (SCICU) and the South Carolina General Assembly. The CIU student body also demonstrated their thanks by gifting Jones, an avid hunter, with an elk knife as a token of their appreciation. “I’ve always appreciated his open door policy and willingness to let students come to his office and talk,” sophomore Joseph Knight added. Jones’ friend, Dr. Andre Rogers, professor of Church Ministry, summed up Jones’ legacy by referencing 2 Timothy 4:7-8.